Come learn and play with us!! Call today for a tour and registration materials! 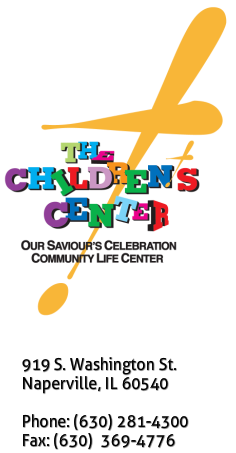 Celebration Children's Center is located in the Celebration! Community Life Center and is a ministry of Our Saviour's Lutheran Church. The Children's Center admits children of any race, color, creed, and national or ethnic origin. God's world is beautiful because of it's many different colors and we welcome the same diversity in our children and their families.